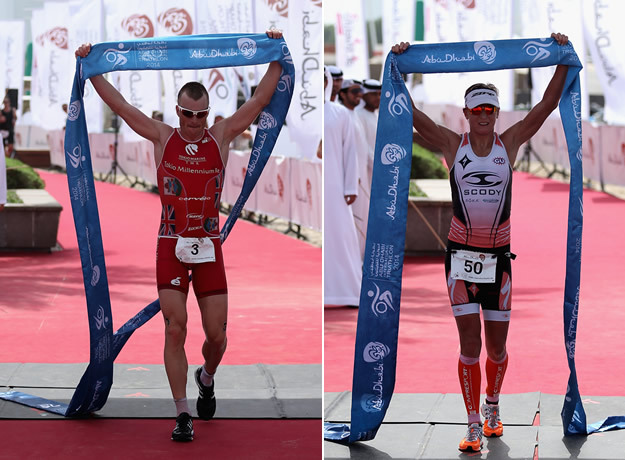 There was to be no third victory for Ironman World Champion Frederik van Lierde today at the fifth Abu Dhabi International Triathlon, as Bermda's Tyler Butterfield matched the feat of his wife Nikki two years ago by taking the title, moving up from his breakthrough third placed finish last year. Australia's Ironman 70.3 World Champion Melissa Hauschildt (AUS) held off a spirited effort from Yvonne van Vlerken - who at one point caught her on the run - to cross the line and defend her title by just 22 seconds. The hot conditions made it a race of attrition which left van Lierde, Sylvain Sudrie (FRA), Bas Diederen (NED) and Butterfield together as they entered T2 at the end of the 200km bike course - with surprisingly 2010 debut winner Eneko Llanos (ESP) off the pace today, and he would arrive a massive 16 minutes later to start the run, seemingly out of contention for a prize money spot. Sudrie initially grabbed the lead starting the run, though could clearly be seen from the race video (accidently) turning immediately right out of T2, rather than a short out-and-back to the left, and inadvertantly gained some time. While Van Lierde spent much of the bike at the head of the race, his usual tactic would be to put the pressure on in the last 50km and lead solo into T2, but that hadn't happened today and off the pace in the early stages of the run, perhaps it wasn't his day. The big Dutchman Bas Diederen has anything but a 'classic' running style, but it is effective, and while Buterfield was moving to the front of the race past Sudrie, Diederen was working hard too. At the end of the first lap of two, havng realised her error, Sudrie repeated the short section of course he had missed out of T2 - his fate would be in the hands of the officials. The hot conditions left everyone looking tired in the final stages, but Butterfield kept his form together enough to take the $40,000 first prize, 47 seconds ahead of a very happy Diederen. 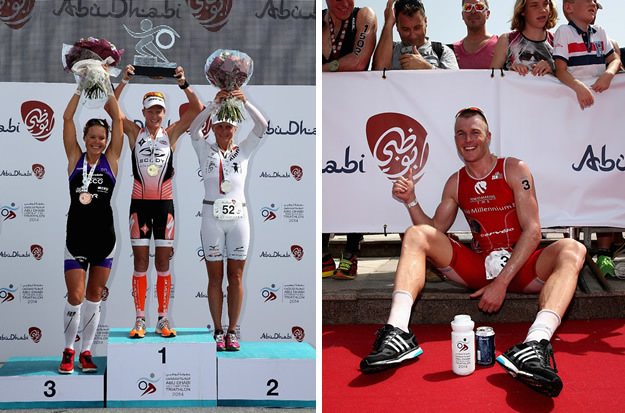 Sudrie took third (subject to officials confirmation), with Ironman World Champion Van Lierde fourth, making it five consecutive Abu Dhabi races finished in the top five. As expected, Great Britain's Jodie Swallow was in a class of her own in the swim, and would gain over three minutes in the non-wetsuit swim to Michelle Vesterby (DEN) and Svetlana Blazevic (SRB), but perhaps more importantly approx 5:30 on defending champion Hauschildt and 7:30 over Yvonne van Vlerken (NED). Leading on the bike, Swallow's quest for victory would come to end courtesy of a wrong turn on the bike - we think she turned at the Short course, rather than the Long course turn point, which added considerable time / distance to her race. The former 'runner' Hauschildt has developed over the past couple of seasons as superb 'biker' too, and her efforts - combined with Jodie's direction issues - would see her pull back her swim deficit and bake her way to the lead before T2. However, this wasn't one way traffic and Van Vlerken was riding even faster. 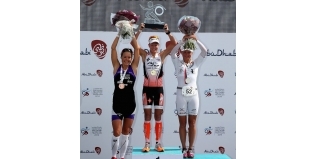 While Hauschildt racked first, the flying Dutchwoman and Michelle Vesterby were within a minute of her, six hours into the race. As Hauschildt said post-race "I've never been run down in a race before"... but Van Vlerken hadn't read that script clearly, and was closing down hard on Melissa during the first 10km loop. While she caught the Aussie World Champ, Hauschildt was able to compose herself and dig in again. She was made to work oh so hard though, and had to fight for all of the final 10km lap to come home and defend her title just 22 seconds clear of Van Vlerken - and looked shattered from the effort. Vesterby ran strongly to take third once more, while Swallow continued to take fourth place and a $3,000 pay cheque. Two very close races in hot conditions - congratulations to Tyler Butterfield and Melissa Hauschildt.